Find hotel near Parque Natural Valle De A .. This is a perfect place to enjoy nature in its virgin state. Its forests, including centuries-old trees, the rich landscapes and more than 160 species of birds residing here - despite not having wetlands - make this natural park one of the most beautiful and unique one on the peninsula. The park has two major landscapes. On one hand there is a huge expanse of pastures that forms the Valley of Alcudia, with its sea of holm oaks and pastures. 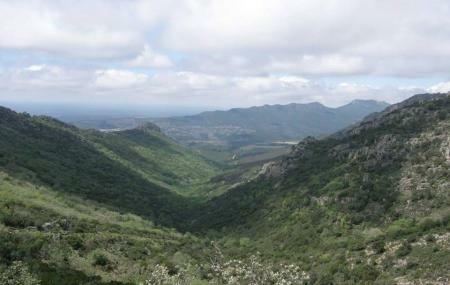 On the other side the mountains, crestones and rocks that constitute Sierra Madrona. Visit this park to spend time in the lap of Mother Nature. To personalise your visit to the city, you can use an all-inclusive Almodovar Del Campo trip planner for the same that will give detailed information about visiting the city. Fine Accommodation options like Hostal Emi-ros, Hotel Jose, Hostal Parrillada La Sal and Hotel Rural Las Cinco Ranas will meet your requirement of where to stay in Almodovar Del Campo. Choose from variety of exclusive Almodovar Del Campo vacation packages for your next visit or create own own. Check out the various options for how to reach Almodovar Del Campo and finish off your vacation package by booking the ideal transfer. Love this? Explore the entire list of places to visit in Almodóvar Del Campo before you plan your trip. Fancy a good night's sleep after a tiring day? Check out where to stay in Almodóvar Del Campo and book an accommodation of your choice.